Marketing is a vibrant field that engages you in the important task of communicating the message of a business to its audience. All businesses depend upon the important work of marketers, and earning your online marketing degree will break the job market wide open for you. A variety of focuses are available to those pursuing an online marketing degree. Some marketing degrees involve advertising, sales, or public relations, while others revolve around market research and product management. Digital marketing is a burgeoning field that challenges marketers to keep up with trends in online advertising and search engine optimization. Most companies have a marketing manager and marketing teams, so teamwork and leadership skills are key. Needless to say, college students who graduate with marketing degrees can find a number of job opportunities in a variety of niches. The number of marketing management positions is expected to increase at a faster than average rate of around 9% over the next decade, according to the Bureau of Labor Statistics. The most successful and satisfied marketing professionals are often creative, highly motivated, and driven by a solid understanding of what motivates consumers. They have highly developed written and oral communication skills, and are excited to help businesses succeed. If this sounds like you, an online marketing degree or online marketing master's degree could increase your career options and bolster your salary. Our guide to the education and career options related to marketing will start you off on your path toward entering and advancing in this exciting field. Many entry-level marketing positions require at least an associate degree, but job candidates with bachelor's degrees are often given preference from hiring committees. Management positions typically require a bachelor's degree and some prior experience in marketing. Both bachelor's and associate degree-holders can work their way up in companies to higher-level positions once they have proven their marketing acumen. Those with graduate marketing degrees are most likely to work in higher-level positions. Associate marketing degrees qualify graduates for many entry-level marketing positions in the realm of advertising, sales, digital marketing, and public relations. Although a two-year, online marketing degree does not immediately qualify you for a role as a marketing manager, there is always opportunity to move up the ladder. If you have an associate degree in this field, you can expect to compete with bachelor's degree-holders for positions, and the competition for entry-level positions can be fierce. Marketing internship experience and other work experience can help distinguish you from other candidates. A four-year marketing degree online qualifies you for a number of entry-level marketing positions and mid-level positions if you have relevant experience. Many marketing managers, public relations managers, and business leaders in general start out in entry-level positions and work their way up in companies. Some companies will only consider you for management positions if you have a bachelor's degree and proven success in the marketing field. A bachelor's degree in marketing will familiarize you with the essentials of marketing as they relate to the field of business as a whole. At Pennsylvania State University, students can customize their bachelor's of science in marketing degree by choosing from a variety of electives, including industrial organization or business-to-business marketing. The marketing curriculum covers topics in retail, eCommerce, advertising, and sales promotion, while business topics cover international business and business strategies. Students must pass a culminating capstone to graduate; the capstone requires students to create a strategic marketing plan. U.S. News & World Report recently ranked Penn State number one in the nation for its online bachelor's degrees. Penn State offers asynchronous online courses that blend independent study with group collaboration. Students interact with peers and professors via Blackboard Collaborate, Skype, email, and discussion boards. Penn State's World Campus also offers webinars on career and student support services throughout the year. Distance learners have access to many online student organizations, including a national honor society. Kennesaw State's online bachelor's of business administration in marketing degree is offered through the university's business college. All of the core courses and most of the electives in this program are offered online. Example courses include entertainment marketing, social media marketing, and marketing for entrepreneurs. Students may choose a general track or specialize in channel marketing, social media and engagement marketing, sports and hospitality marketing, or professional sales. Students also have the option of creating their own specialization in collaboration with an advisor. Kennesaw State's online programs are offered through the Southern Regional Education Board's Electronic Campus (SREB), which is built on the Brightspace learning platform (powered by D2L). Distance learners have access to a full set of academic services, including library, tutoring, financial aid, and advising resources. Students can choose from multiple online marketing degree programs at Liberty University. These include a bachelor's of science in marketing analytics and a bachelor's of science in business administration marketing: sales management and professional selling. The analytics program focuses on measuring marketing effectiveness and performing research to identify marketing opportunities for particular populations, while the sales management emphasis is geared towards students who want to engage with potential customers in retail and other consumer-based environments. Students may also be able to apply for credit toward their degree requirements based on past professional experiences. The marketing curriculum at Liberty combines a Christian perspective with modern business practices; classes integrate Christian values into the coursework. Online students have the option of attending campus for a one-week intensive residency. Asynchronous courses are accessible via the Blackboard LMS. Distance learners can connect to many online academic resources including library services, tutoring, writing center services, and disability support. Florida International University offers a bachelor's of business administration with a concentration in marketing. Major courses include consumer behavior, marketing in today's competitive job market, and personal selling. Students can also customize their degree with elective choices such as marketing analytics and export marketing. Online undergraduates have the option of joining the FIU Honors College by participating in problem-based interdisciplinary courses, a study abroad program, or by completing a supervised thesis project. All undergraduates at FIU are paired with a success coach, who helps guide students throughout their program. A dedicated tech support team is available 24/7 to aid with students with their online experience. Courses are accessible through the Florida Virtual Campus, which is powered by Blackboard. Online proctoring is available through ProctorU. Distance learners can also obtain career and counseling advice online. Southern New Hampshire University offers a marketing degree online that provides students with a foundation in consumer behavior, brand communication, international marketing, and market research. 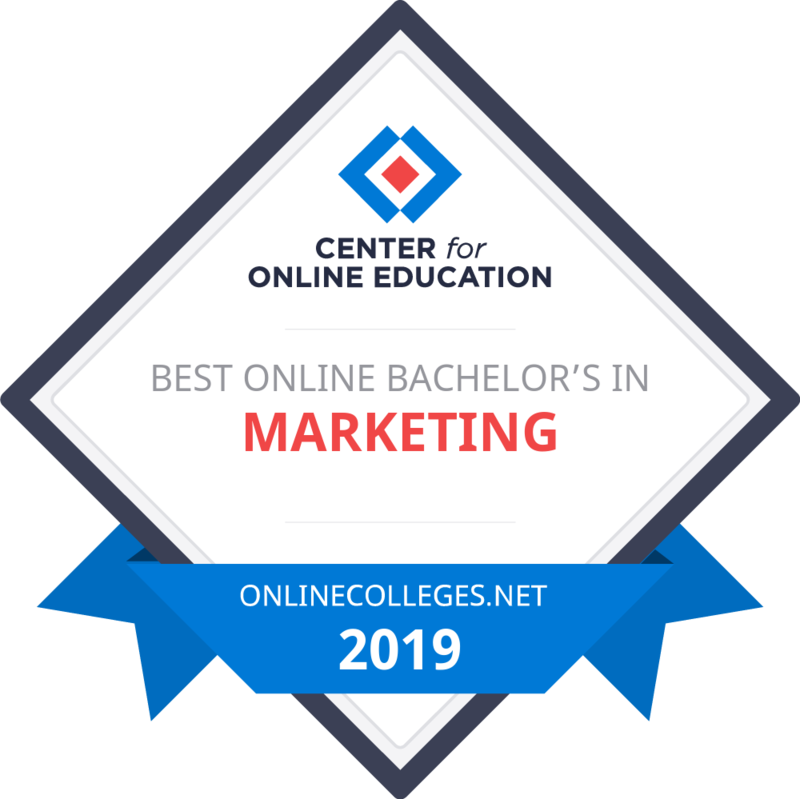 The bachelor's of science in marketing offers students the option of choosing a social media marketing concentration, which focuses on building a brand through social media and marketing to online audiences. Other elective areas include advertising, campaign development and management, branding, and retail and sales. This program is self-paced, and students complete course requirements over six nine-week terms throughout the year. Students can transfer up to 90 credits from another qualifying institution to meet degree requirements. SNHUConnect acts as a virtual student union where distance learners can interact with faculty and their peers to share ideas and get help with assignments and projects. Students also have access to an online writing center, Smarthinking tutoring services, the library, and career services. Online courses at SNHU are delivered through the Blackboard LMS. The bachelor's of science in marketing at Indiana Wesleyan University offers four areas of emphasis, including marketing analytics, social media, service and nonprofit marketing and digital branding, and advertising and promotions. The curriculum of this online marketing degree focuses on critical thinking, analytical skills, and adopting a global perspective for marketing to diverse audiences. Students also learn how to integrate a biblical framework into their decision making, which guides their interactions within the marketing environment. Core courses include information technology for marketers, ethical and legal business concepts, and statistics for marketers. Courses are taken sequentially, with most students completing core requirements in one year. Students can earn up to 40 credit hours by finishing prior learning assessments. Online resources available to distance learners include research assistance through the online library and one-on-one academic advising. Courses are offered entirely online or in a blended format, where students can opt to take some on-campus classes. Concordia University's online marketing degree is a bachelor's of arts in marketing. This program is designed for working professionals. The online learning environment at Concordia emphasizes interactive learning exercises and projects. Students learn both marketing and management skills in the context of modern marketing applications and issues. Major courses include new media literacy and social media, analytics and technology, and marketing in the global environment. Courses are accessible through the Blackboard LMS, and each class is completed over a seven-week session. Distance learners also have access to all of Concordia's library services. The university maintains a number of corporate partnerships with companies including AT&T, Target, and United Airlines; discounted tuition rates are offered to employees from these companies. Nova Southeastern offers a bachelor's of science in business administration in marketing through their business and entrepreneurship college. Concentrations are available in marketing management, professional sales, digital and social media, service and retail marketing, and global and regional markets. Students may also complete one or more interdisciplinary minors to complement their degree focus. Graduates are prepared to manage and analyze brand and marketing campaigns, perform market research and implement marketing strategies, and use digital marketing tools effectively. The core curriculum of this program covers the foundations of business, including accounting, management information systems, law and ethics, and strategy and policy. Courses are completed over eight-week terms through NSU's Sharklearn platform, which is supported by Blackboard. All marketing students also have the opportunity to join the American Marketing Association chapter at NSU. Students pursuing a marketing degree online at Colorado State University can choose from a long list of specializations, including computer programming, criminal justice management, healthcare management, public and nonprofit management, and small business and entrepreneurship. The online bachelor's of science in marketing covers a range of fundamental marketing topics, such as consumer behavior, promotional strategies, sales and market research, and marketing strategies and tools for the digital age. All students also complete a final capstone project and practicum at the end of the program. CSU emphasizes a project-based online curriculum. Asynchronous courses are accessible through the Schoology LMS, and students can complete each course or module at their own pace. Coursework includes interactive videos, lectures, and mastery exercises. Distance learners pay in-state tuition rates, and the cost of tuition at CSU is guaranteed not to increase as long as a student is enrolled. The bachelor's of science in marketing management at Western Governors University is designed for both professionals in the field and students who are looking to start a career in marketing. Courses cover major areas of business, including marketing and communication, finance, and project management. WGU has a unique competency-based curriculum structure, which means that students who master material at a fast rate can move through the program more quickly. A final written capstone project is also required. All new students are assigned a student mentor, who serves as a primary point of contact for the length of the program. Each course also has its own designated mentor for course-specific questions. Online students have access to a dedicated student support center, including library services, IT support, and counseling. Additionally, tuition in this program is offered on a per term basis; if they choose to, students are allowed to complete extra courses (beyond 12 credits) at no extra cost. The University of Massachusetts offers a bachelor's of business administration in marketing through their online management school. As one of the top online marketing degree programs in the country, this program's curriculum spans a wide range of marketing concepts, including retail, sales and distribution, and digital marketing. Upper-level electives allow students to further customize their degree by taking classes that focus on hospitality and tourism management, sports management, and finance, among others. Online courses at UMass are accessible through the Blackboard Learn LMS. The university's online resource center is designed as a virtual meeting space that enables students to connect with their peers and faculty and share advice and resources. Military professionals seeking to enroll at UMass have their admission fee waived; they also receive a discounted rate on all online BBA/BS courses. The bachelor's of arts in business administration from the Florida Institute of Technology focuses on modern marketing applications, including social media, pay-per-click, and search engine optimization methods. Graduates are prepared to develop, distribute, and promote products and services through integrated marketing and public relations campaigns. In addition to core coursework, students can customize their degree by choosing a variety of electives, such as brand management marketing and entertainment and sports marketing. The online programs at Florida Tech are offered in partnership with University Alliance and are accessed via a proprietary LMS. Asynchronous course content includes videos, interactive exercises, discussion boards, and chat rooms. Courses are structured in eight-week sessions, and students can engage with instructors through discussion boards, email, chat, and phone. Distance learners also have access to online enrollment services, tech support, career management, an online library, and tutoring through Smarthinking tutoring. The bachelor's of science in business administration offered by Old Dominion University is one of the best online marketing degree programs in the country. Coursework in this program is interdisciplinary and includes topics in economics, information technology, law, and policy and strategy. Specific marketing course topics include multi-national marketing, consumer behavior, and legal environments of business. Many of the online courses at ODU are taught asynchronously, but some have synchronous components including weekly web conferencing through WebEx software. Students also have the option of completing an internship at an approved organization within their home state or town. Distance learners receive free Lynda.com tutorials and access to the iAchieveODU app, which allows students to create study materials, plan coursework schedules, and watch Khan Academy tutorials. Saint Leo's online bachelor's of arts in business administration with a marketing specialization teaches students about advertising, management, retailing, consumer relations, and small and international business operations. Courses also cover fundamental business concepts in accounting, management, economics, and law. Students can customize their study by enrolling in a variety of electives, such as personal selling and social media marketing. The school integrates its academic curriculum with Catholic beliefs and traditions; students enrolled at Saint Leo must also complete courses in religion, science, basic math, and writing. Distance learners participate in online discussions through the Southern Regional Education Board's Electronic Campus (SREB). Online organizations, including accounting and business associations, allow online learners to get involved and connect with their on-campus peers. Students also have access to personal advising, research assistance, library services, and peer mentoring. Dallas Baptist University offers a marketing degree online. The curriculum for this bachelor's of business studies in marketing covers a variety of business topics including promotional strategy, information systems for management, and consumer behavior. Students must also complete general education requirements and a series of religion courses, including a course called "developing a Christian mind." Online courses are divided into weekly sessions, in which new course material is made available to students. Many instructors host weekly threaded discussion forums, with occasional group assignments. All courses are taught asynchronously and are accessible through the Blackboard LMS. Students may apply to receive elective credit for prior military or professional experiences. Distance learners also have access to a 24-hour helpdesk, a dedicated DBU online education office, and online writing and library services. The University of Memphis offers an online bachelor's of business administration program in marketing management. Students in this program explore the concepts behind marketing principles and market research, sales strategies, consumer behavior, advertising, and supply chain management. Online programs at UofM are built on the eCourseware learning platform, through which students have access to all course content, assignments, assessments, discussion boards, and chat rooms. Most courses are taught asynchronously, although some may have synchronous elements that are planned in advance. A step-by-step online orientation is also available for new distance learners at UofM. Students have the option of completing all courses online or registering for a combination of online and on-campus classes. Distance learners are provided with a comprehensive set of resources, including library access, career counseling, and disability services. The online marketing degree at Regis University features a curriculum that focuses on emerging trends, including e-marketing basics. Undergraduate students enrolled in this program also have the opportunity to work towards a graduate degree at Regis simultaneously; they can apply up to four graduate courses towards their marketing degree requirements. Upper-level major courses include topics such as influencing buyer behavior, digital marketing media tactics, and a senior capstone project. Courses are accessible through the university's WorldClass learning platform, which includes integrated financial aid and information technology support. Online courses are offered in accelerated five- or eight-week sessions in an asynchronous format. A virtual student lounge allows distance learners to interact with other students and instructors through joined groups and email by using Yammer software. Online students at Regis pay the same tuition as in-state residents. Online marketing students at Fort Hays State may choose a general marketing focus or concentrations in business development and sales or digital marketing. This bachelor's of business administration in marketing prepares graduates for careers in business-to-business marketing, retail, international marketing, public relations, and market research. The marketing curriculum at Fort Hays State emphasizes the art and strategy involved in developing products and bringing them to market. Students take core courses in both business and marketing fundamentals. Students can further customize their degrees by choosing electives such as opportunity recognition and idea generation, management of small business, and persuasion. Virtual student services include a career resource center, a writing center, tutoring, and library services. Coursework may be asynchronous or synchronous depending on the class. Online courses at Fort Hays State are delivered through the Blackboard LMS. Columbia College offers a marketing degree online. Students may choose a bachelor's of science or bachelor's of arts degree in business administration with a marketing concentration. Graduates learn the skills need to plan, create, and implement product release and marketing campaigns. They also learn about segmentation and pricing strategies, product and service development, and marketing and management strategies for business and consumer audiences. Examples of major course topics include public relations writing, e-marketing, and sports and event marketing. Online courses are accessible through the D2L learning platform. Classes are offered in accelerated eight-week sessions with six registration periods throughout the year. Students may also transfer up to 90 qualifying credits towards their degree requirements. Military students enrolled in online courses at Columbia College receive a discounted tuition rate. Troy University offers one of the nation's top-ranked online marketing degree programs. The program features a concentration in marketing emphasizes integrated marketing strategies in a global environment. Electives in this program include supply chain management and personal selling. Students may also choose to pursue advanced study in either business or law. Both part- and full-time enrollment options are available. This is a hybrid program, where some courses require on-campus attendance and participation. Online courses at Troy are delivered through the Blackboard LMS. Students who are new to the virtual classroom can enroll in a free introduction to online learning. Distance learners also have access to the Trojan Café, which is Troy's virtual student union. Park University's online marketing degree covers marketing fundamentals, business and industry trends, and ethics and social responsibility. Students obtain a bachelor's of science in marketing that teaches them both marketing strategies and critical-thinking skills. The curriculum introduces statistical research methods, which helps students interpret marketing literature and deliver effective presentations. Online courses at Park University are delivered through the Canvas LMS. Some classes also utilize Pirate Patch, which is a new teaching program that connects classrooms through live audio and video streaming. Courses are structured in accelerated eight-week sessions with five different starting points offered throughout the year. Distance learners also have access to online library resources and online tech support. Current military members, veterans, and their family members are eligible to receive discounted tuition rates. Students can complete an online marketing degree program through the University of Wisconsin-Stout, which offers a bachelor's of science in digital marketing technology. This program has a strong tech emphasis and includes coursework in HTML, web development, responsive design and usability, SEO, and animation and multimedia. This multidisciplinary curriculum integrates marketing theory and principles with business, computer science, and graphics management. Students learn how to create effective web content, evaluate site design and usability, and develop web applications. Potential careers include roles as social media specialists, web developers, eCommerce managers, and web traffic analysts. The average program completion time is four years. UW-Stout online courses are accessible via the D2L platform. Distance learners also have access to Brainfuse eTutoring, library and career services, and computer and software training. Davenport University offers a marketing degree online through its business college. The program has concentrations in advertising and promotion, sports marketing, business-to-business marketing, and professional selling. This bachelor's of business administration in marketing prepares students to be strategy-oriented marketing professionals. Its curriculum covers the fundamentals of advertising and promotion, product and service production, pricing strategies, and social media. Courses in business also lay the foundation for more advanced marketing coursework, and students learn the research and analytical skills needed to identify market issues and opportunities. A field experience or internship are part of the major course requirements; these must be arranged by the student. DU uses the Blackboard LMS to deliver its online courses, which are taught asynchronously. Online courses are condensed from 15 weeks into seven- or 10-week periods. Online resources include tutoring, testing, library access, and career services. The bachelor's of business administration in marketing offered by the University of Wisconsin-Whitewater places a focus on understanding consumer behavior and creating consumer-oriented marketing campaigns. Students can transfer up to 90 existing academic credits towards their degree requirements. Major course topics include social media and interactive marketing, entrepreneurial and advanced sales techniques, and business-to-business marketing. This program's curriculum also covers accounting, finance, supply chain management, information technology, and business law. All course lectures are recorded in an innovative media studio, and online classes coincide with the campus's academic calendar. Courses span a period of 16 weeks in the fall and spring, and there are three- and six-week offerings during the summer. All exams and other assignments can be completed online. Distance learners also have access to an online student support center, which has a help desk, technology specialists, and online advisors. Cleary University's online marketing degree teaches graduates how to design, develop, and implement new products and service solutions. The coursework in this bachelor's of business administration degree in marketing program is built around the analysis of case studies, project-based learning approaches, and other interactive assignments. This work gives students hands-on experience with real-world applications and decision-making. Sample classes include quantitative business analysis, SEO strategies and metrics, and creativity and innovation. A final professional project is also required for degree completion. Cleary University has a small student-to-faculty ratio of 11:1, creating a collaborative environment that allows students to directly interact with their professors. Online courses and free tutoring sessions are available via the Moodle LMS. Distance learners also have access to an online library, career services, academic advising, and IT support. An online marketing master's degree program prepares students to take on management roles in marketing, public relations, advertising, and sales once they graduate. Many hiring managers looking for mid-level and senior-level marketing professionals and prefer job candidates with graduate-level marketing degrees. An online marketing master's degree is a sign of specialization and advanced knowledge in the field of business. Graduates of marketing master's programs typically have a significant amount of insight into consumer behavior, finance, and marketing strategies. An online doctorate degree program in marketing differs from an online marketing master's degree program in that it exposes students to both the business and the academic side of marketing. It prepares students to conduct advanced marketing and consumer behavior research and to ultimately find careers as top researchers in the field or full-time professors of marketing in university business departments. Sales managers oversee inside sales teams, outside sales teams, or both, depending on the size and scope of their companies. They analyze sales trends, identify leads, and create sales and marketing quotas and metrics based on business forecasting research. Sales Managers also analyze industry trends and competitors' prices to provide recommendations about pricing of goods and services. Sales managers should have leadership skills, problem-solving capabilities, attention to detail, and an interest in analyzing data. Public relations specialists work as brand ambassadors for individual companies and agencies. They plan and oversee public relations campaigns to enhance client reputation and improve the brand messaging of clients. They write press releases, email campaigns, white papers, and other promotional materials. Public relations specialists also participate in interviews with the media and identify press opportunities for the companies they serve. Excellent written communication skills, attention to detail, and an interest in sharing the stories and missions of businesses is a must if you want to excel as a public relations specialist. Market research analysts collect and interpret data about consumer habits and provide clients with marketing recommendations and reports based on data and trends. They meet with clients to understand their goals, identify opportunities for collecting consumer data, and present opportunities to clients based on their research. Market research analysts need both people skills and data-driven minds. If you are interested in consumer behavior and statistics, you may enjoy this position. Advertising managers typically work for agencies that serve business clients. They meet with clients to discuss possible ways to increase leads and sales. They are experts in print, online, and in-person advertising strategies. They plan out comprehensive advertising strategies for clients, create advertising budgets, and procure media placements, all for the purpose of compelling consumers to action. If you have a creative and strategic mind and are an exceptional communicator, you might excel as an advertising manager. The Marketing Research Association (MRA) offers a few different certificate options for marketing professionals. In particular, the MRA Certificate in Qualitative Research Principles and the MRA Certificate in Quantitative Research Principles are popular options that help marketing professionals build their credentials and experience in the realm of research. Both of these MRA certificates require the completion of courses offered by MRA. These courses expose you to advanced methods of consumer and marketing research. You should take this exam if you are interested in advancing your career as a marketing researcher or analyst. MRA-certified professionals often already have their marketing degrees and are working as marketing professionals while they complete the certification programs. The Public Relations Society of America (PRSA) offers Accreditation in Public Relations (APR) through an exam that tests your professional knowledge and knowledge of public relations practices and ethics. This exam is right for you if you are a seasoned public relations professional who wishes to bolster your credentials with the industry's most-respected and well-known certification. If you are a college student or recent graduate, you may want to complete PRSA's Certificate in Principles of Public Relations before you sit for the APR exam. The Certificate in Public Relations is specifically designed for students earning their marketing degrees or recent graduates of undergraduate marketing degree online and offline programs. The American Marketing Association (AMA) offers the Professional Certified Marketer (PCM) credential to professionals who successfully pass the necessary exam. The PCM exam tests your competency and knowledge of core marketing principles and marketing trends. If you have an online marketing degree and two years of professional experience, you are qualified to take this exam. Current marketing students and those with marketing degrees and less than two years of relevant experience are not eligible to sit for the PCM exam. A PCM credential provides further proof of your knowledge and competency as a marketing professional.